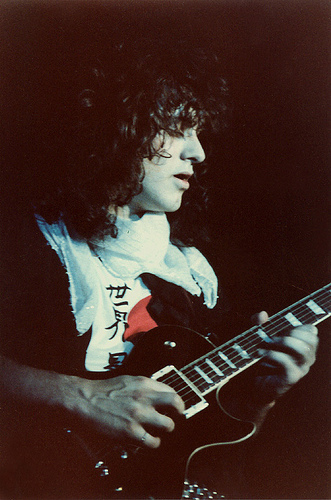 Vivian Patrick Campbell was born on August 25, 1962. Campbell is a northern Irish rock guitar player, who began playing at the age of twelve and went on to play in many successful bands. He has played for Sweet Savage (Irish band), Dio, Whitesnake, Riverdogs, Shadow King, and currently Def Leppard. Vivian joined Sweet Savage at the age of 15. The band consisted of Trev Fleming, David Bates, and Ray Haller. Sweet Savage, most notably, influenced Metallica, who covered "Killing Time" on their Garage Inc. album. However, in 1983 Vivian left the group to join Dio, replacing Jake E. Lee who left the band to join forces with Ozzy Osbourne. When Campbell joined up with Dio, Ronnie James Dio had three songs that he had already written with Jake E. Lee, one of those being the song "Don't Talk to Strangers". Campbell recorded his first album with Dio entitled, "Holy Diver", which contained some of Dio's biggest hits. After the band finished their successful tour promoting "Holy Diver", they were back in the studio. The follow up album was entitled "The Last Line", which charted at number 23. Once again the band played to sold out arenas and festivals nationwide. The next album was "Sacred Heart", which although not as successful as the previous two, still managed to break the Top 30 in the charts. In 1986, Campbell increasingly became unhappy with the direction of the band and was invited to join the group Whitesnake, featuring former Deep Purple vocalist David Coverdale. He accepted the invitation and, following the "Sacred Heart Tour", officially left Dio, leaving Giuffria guitarist Craig Goldy to fill the void. Campbell was fired shortly after the Whitesnake 1987 tour because he was said to have a "bad attitude". In 1992, Vivian began to play with the rock band Def Leppard. He replaced Steve Clark, who had died in 1991. According to Phil Collen, Campbell fell right into position with the band. Vivian Campbell has spent the last seventeen years of his life with Def Leppard, mostly as a rhythm guitarist. In 2005 Campbell released a solo album titled, "Two Sides of It". "Two Sides of It" covers some of Campbell's favorite blues songs and one of his very own blues tune. Vivian Campbell currently lives in Southern California with his wife and two kids. Vivian Campbell - "When I joined Dio in 1982, I had a very direct setup of Les Paul, through an overdrive pedal, into a Marshall." Vivian Campbell - "My setup with Def Leppard has remained basically unchanged for the last several years and consists of Marshall JMP preamps, various rackmount effects units, and Marshall and Mesa Boogie power amps all being united though a Bradshaw switching system. This amount of equipment and the versatility of a midi-programable switching system is very necessary in a band like Leppard, as our music is multi-layered with many delay-dependant programe changes, and a LOT more intricate than is blues." Vivian Campbell - "The equipment I used on "Two Sides Of If" is actually all listed, song by song and in great detail, in the CD booklet itself. I wanted to include that because it's the kind of thing that would have interested me as a guitar kid!" Do you know more about what gear Vivian Campbell used? Please Contact Us.